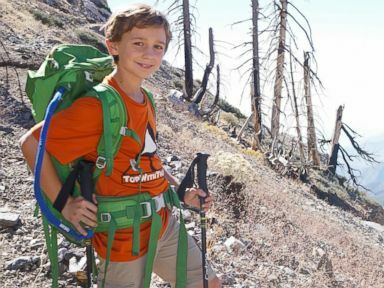 At 9 years old, Tyler Armstrong hopes to set a new record by climbing to the top of Argentina's Mount Aconcagua. At 22,841 feet, Aconcagua is the tallest mountain in the Western and Southern Hemispheres. "The most exciting part is going to be reaching the top and having the world record," said Tyler. The fourth grader from Yorba Linda, Calif., is no stranger to tall summits. Last year, he became the second youngest person to conquer Mount Kilimanjaro. And at the age of 7, he became the youngest person to climb Mount Whitney in a day. But Aconcagua will be Tyler's toughest challenge. It is an icy two week climb, and temperatures can drop to minus 20 degrees Celsius, or minus 4 degrees Fahrenheit. "It takes lots and lots of training," said Tyler. "I had to do ice-climbing training, so if I fall I can stop myself and not slide down the mountain. We're really working on my abs a lot. All the weight from my backpack and all the stuff that I'm carrying goes where your abs are." Tyler and his father, Kevin Armstrong, leave for Argentina on Dec. 7. The age requirement to climb Aconcagua is 14, so the Armstrong family must first get the local courts to approve a special hiking permit for Tyler. "Tyler's a couple of years ahead of the other kids that have gone down and been successful at getting the early permits," said his father. "This time we're taking more mountaineering gear with us, such as ice axes, crampons and harnesses, along with a professional guide." Tyler's father said he's aware of the risks associated with a climb of this magnitude but believes Tyler is ready. "As a father I would never put my son in danger," said Armstrong. "There are dangers to climbing any mountain. He's taken the proper training, and he's proven that he can do it." Tyler is also climbing with a mission: He's raising money and awareness for the organization Cure Duchenne. Duchenne is a form of muscular dystrophy that affects 300,000 boys worldwide. Watch video of how a boy with Duchenne learned to walk again. "They can't walk, and that's like the opposite of me," said Tyler. "I want them to climb with me when we find a cure." Armstrong said he was proud of his son, and admitted he gets tired trying to keep up with Tyler. Each journey has been his son's idea. "Tyler's taking me to a whole new level. I never dreamed I'd be doing this stuff. I hate the cold weather, so Tyler's taking me places that I never thought I'd be going to," said Armstrong. They said they both enjoy the father-son bonding time their adventures bring. Before Tyler's trek up Aconcagua even begins, he's already eyeing his next mountain. "If I want to do it, I'll do Mount McKinley in Alaska," he said.